Do you really think Santa checks all the lists twice? When you are Santa's favorite elf, there are a lot of perks. Like the condo at the North Pole. Like getting to ride shotgun in the sleigh with Santa on Christmas Eve. Like getting to split the cookies and milk with him between trips. And like not having to be the one who has to go down the chimney. But there are a lot of responsibilities that go along with the job, too. You’re working all year long, keeping the reindeer in shape, packing the sleigh efficiently, inspecting package wrapping and managing hordes of other little elves throughout the seasons. Not to mention all that naughty and nice and checking lists twice stuff. Think you’re up to the job? 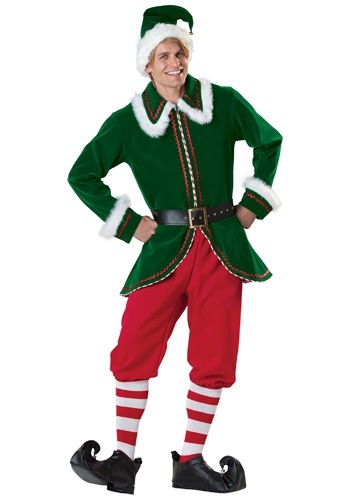 Then you’ve gotta get suited up for the job, too, and our Adult Santa’s Elf Costume is as North Pole official as they come! There’s no better time to test out a new gig and new duds than Halloween. Hey – party hopping is great practice for hopping rooftop to rooftop delivering presents at Christmas! The bright green elf jacket zips up the front amid festive red and white trim. Very senior elf level, if you ask us. Winter white faux fur trims the collar and cuffs of the jacket to make it seasonally appropriate. The red pants pull on with elastic (in case you get into too much Halloween candy) puff out at the bottom in perfect elf style. And with the matching green and white faux fur hat and pointy toed shoe covers with bells, you’re guaranteed to get the job.